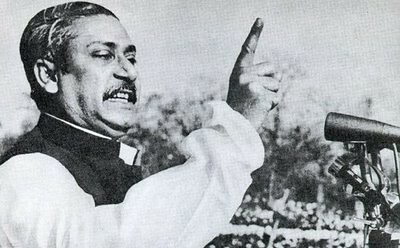 The Speech of 7th March 1971 was a speech given by the Father of the Nation Bangabandhu Sheikh Mujibur Rahman, architect of independent Bangladesh at the Ramna Race Course Maidan (currently Suhrawardy Udyan) in Dhaka to a gathering of over two million people. The speech delivered encouraged the Bengalis to start nine-month long bloody struggle for freedom. ‘Ebarer Sangram Amader Muktir Sangram, Ebarer Sangram Swadhinatar Sangram’ (“this struggle is for our freedom, this struggle is for our independence”), is what the architect of the nation’s independence famously pronounced. Immediate lifting of martial law. Immediate transfer the power to the elected representative of the people before the assembly meeting March 25. He asks the people not to pay taxes and asks the government. 2. The secretariat, government and semi-government offices, High court and other courts throughout East Bangla will observe Hartals. Appropriate exemptions will be announced from time to time. Radio, television and newspapers shall give complete versions of Bangabandhu’s statement and shall not suppress news about the people’s movement, otherwise Bangali worker in these establishment shall cooperate. Railway and ports may function, but railway and port workers will not cooperate if railway or ports are used for mobilizing of forces for the purpose of repression against the people. Only local and inter-district telephone communication shall function. All educational institution shall remain closed. Banks shall not effect remittances to the Western wing either through the State Bank or otherwise. Black flags shall be hoisted on all buildings every day. Hartal is withdrawn in all other spheres but complete hartal may be declared at any moment depending on the situation. A ‘Sangram Parishad’ should be organized in each union, mohallah, thana, sub-division – under the leadership of the local Awami League units. He exhorted the people to turn every house in East Bangla into a fortress.